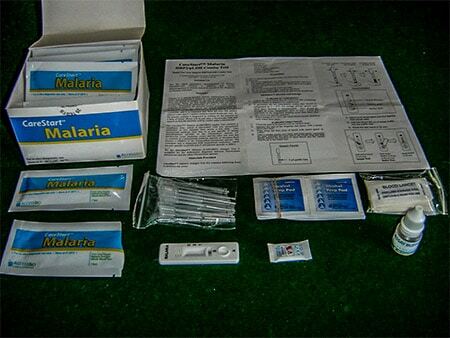 Test for Malaria: safe, quick, easy to use and effective. 25 “Lab in a Pack” testing kits. Each unit contains all items necessary for a one time test on one person. One “Lab in a Pack” test unit. This test can only be used once then the contents must be discarded. CareStart™ Malaria RDTs are rapid diagnostic tests that diagnose malaria infection from whole blood of patients in 20 minutes. Detecting combinations of Plasmodium parasites that cause malaria in humans. Reliable test results with high sensitivity and specificity.